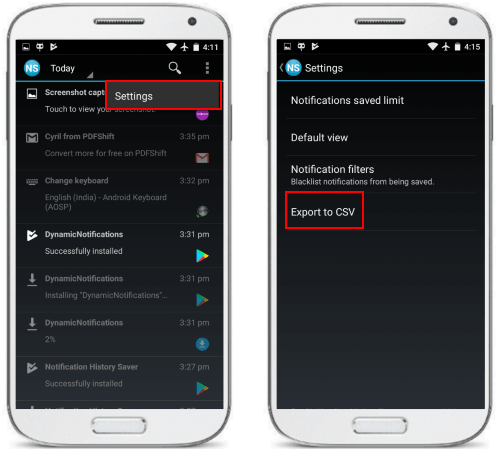 This tutorial explains how to export Android notification history to Excel. In this post, I will mention two apps that you can use to save the Android notification history to CSV. The apps which I have listed here log all the notifications on your phone and then help you export them. You can easily see all the notifications that you have received and then you can easily export all of them to a CSV file that you can eventually open in an MS Excel. 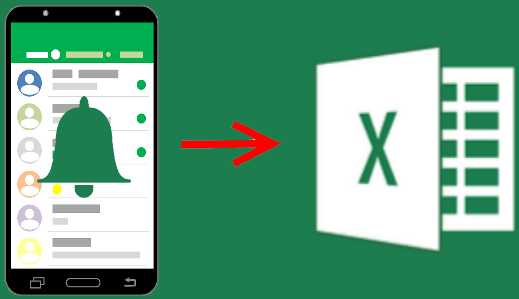 In Excel, you can see the data like app name, package, time, title, and notification text. You can see this data and then do whatever you want. Sometimes, Android notifications get lost accidentally. And if you don’t want to lose your important notifications then you can use the following apps. These apps will keep logging the notifications for you even if you remove them from notification center. You can see the full log of notification history and then you can save that in a CSV file as well. However, in one of the following app, you don’t get the CSV file directly. You will get the notifications in JSON and then you can use an additional online tool to get the CSV out of it. How to Export Android Notification History to Excel? Notification Saver is one of the best free Android app that lets you export Android notification history to Excel. It logs all the notifications that appear in the notification bar and shows them to you. You can also set a limit on number of notifications to save in it. On its interface, you can even search particular notification by app name or title text. Additionally, it offers you options to filter notifications as well. The interface is very simple and after analyzing all the notifications, you can easily export notifications to CSV. In the CSV file, it stores the information about the app, package name, time, notification title, and notification text. Install the app from the above link and then simply allow it to access the phone’s notifications. After that, you can let it run in the background and watch new notifications. Do note that, it will not show you the notifications which were there in your phone before installing this app. It will start logging all the app notifications and then you can see them all. To export them to CSV, simply go to Settings and then you can and use the “Export to CSV” option. And then you can share the CSV file with anyone you want. 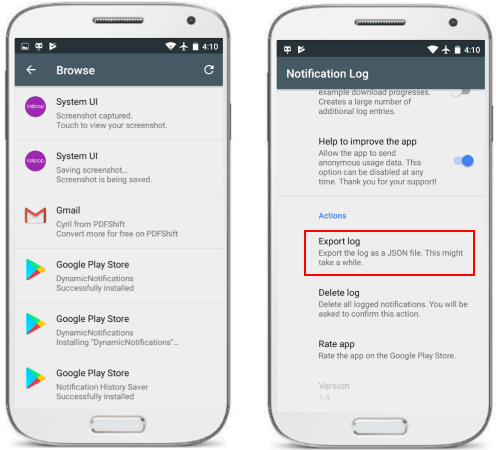 Notification Log is another free app that allows you to export notifications from your Android. However, this app is meant for developers for testing notifications from all the installed applications. And that is why this app exports the notification log in JSON format. 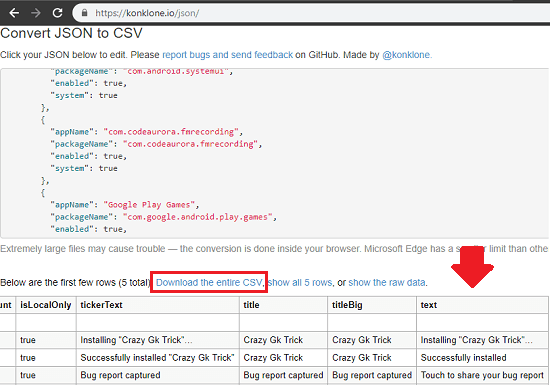 You can easily share the JSON file over email and use an additional tool to convert the JSON data to CSV to open in Excel. So, to get the notification log, you will have to break the process into two parts. First, you will have to get the JSON file containing all the notifications log. After that, you can easily convert the JSON file to CSV and then do whatever you want. Simply install the app from Play Store and then you can allow it in the accessibility section to access phone’s notifications. Next, it will start logging the notifications that will add in your phone. And then you can export them from the phone easily. Just tap on the “Export log” option and it will open the share option and you can send the file over email. There is an online tool, called “konklone.io” that you can later use to convert the JSON to CSV. You can access the homepage of this website from here and then paste the contents from the JSON file that you obtained earlier. If there are some hashtaged words in the JSON file then remove them to see the tabular output. After that, you can save the data from the website as CSV and then use that in Excel to view that. These are the only free Android apps that I found which can help you export Android notification log to Excel. You just have to allow these apps to access system and apps notifications. After that, in just a few taps, you can get the final CSV file that you can open in Excel and then do whatever you want. If you want then you can later convert CSV file to Excel or any other tabular data format that you want.